Because the conductivity of tap water is high, and the pH of pure water is low, the conductivity is 0. Therefore, the water prepared in a ratio of 3:1 is selected in this experiment. The tap water has a pH of 7.4 and a conductivity of 890us/cm; the purified water has a pH of 5.6 and a conductivity of zero. According to the ratio of purified water and tap water of 3:1, the pH of the water is 7.02, and the conductivity is 270us/cm. 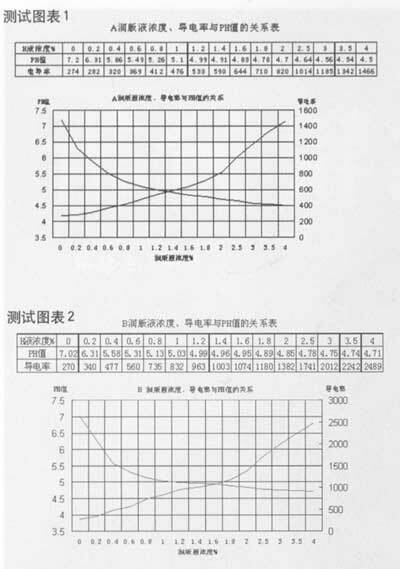 From the test chart, it can be seen that both A and B dampening fluids are "buffered" fountain solutions. Not suitable for automatic addition of the machine, the concentration of the fountain solution should be manually configured. A dampening solution PH value: 4.5-5.5; concentration: 4%-0.6%; conductivity: 1500-400us/cm. B fountain solution PH value: 4.5-5.5; concentration: 5.2% -0.5%; conductivity: 2500-500us/cm. The two fountain solution additives have different conductivity in the same water quality and same concentration ratio. Fountain solution suppliers recommend the ratio requirements: A dampening fluid standard concentration of 2% -2.5%, PH value of 4.5-5.5; B dampening fluid standard concentration of 2% (soft water), 3% (hard water), The PH value is 4.9-5.2. According to the test results: A fountain solution with a concentration of 2%, a pH of 4.7, conductivity of 820us/cm. B fountain solution with a concentration of 2%, PH value of 4.85, conductivity of 1382us/cm. Due to the need to add about 10% of isopropanol, when the actual ratio is added, the amount of fountain solution should be calculated by adding the total volume of isopropanol. Otherwise, the concentration of fountain solution will be insufficient and the pH will increase. , affect the wetting effect. Through actual verification in production, from automatic addition to manual addition, the concentration of the fountain solution is accurately controlled, the wetting performance is good, and the printing failure caused by the fountain solution is effectively reduced. We can combine non-stick Frying Pan , Saucepan , saucepot, Grill Pan , Pizza Pan , Crepe Pan with different size & thickness freely, many non-stick coatings and handles can be available.